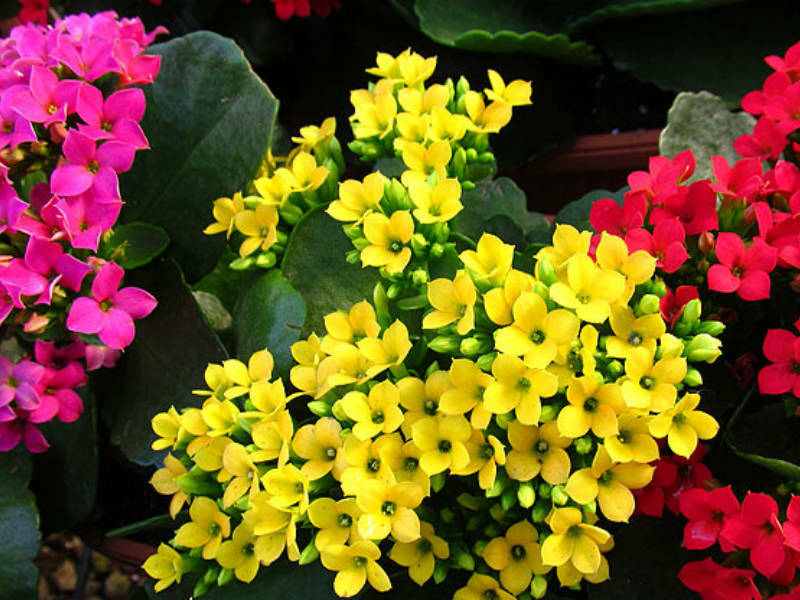 Share the post "Kalanchoe: Interesting Facts, Growing Tips, Toxity"
Kalanchoe, also written Kalanchöe or Kalanchoë, is a large genus of about 125 species of tropical, succulent flowering plants in the family Crassulaceae, mainly native to the Old World. Kalanchoe has a very wide distribution area: only one species of this genus originates from the Americas, 56 from southern & eastern Africa and 60 species in Madagascar. It is also found in south-eastern Asia until China. Most of the species interesting to collectors are coming from Madagascar or South Africa. These species are generally subshrubs with succulent leaves. The genus was first described by the botanist Michel Adanson in 1763, who cited Camellus as his source for the name. The name Kalanchoe came from the Chinese name “Kalanchauhuy”. Everyone pronounces it differently (and nobody knows exactly who’s right), but we’ve all seen the colorful, happy flower clusters of Kalanchoe blossfeldiana, or flowering Kalanchoe. 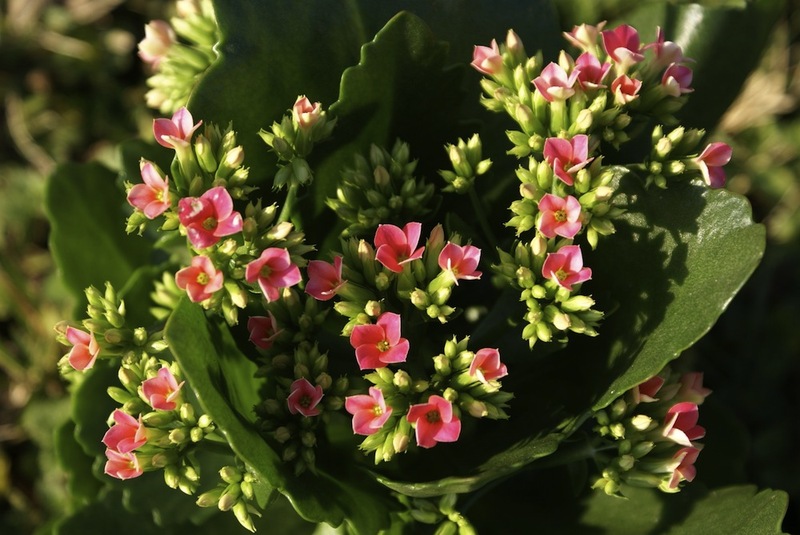 A cousin to the Jade plant, flowering Kalanchoe is a fairly low-maintenance succulent commonly grown as a houseplant. Flower heads on kalanchoe blossom in bright oranges, pinks, yellow, red, and white on a compact, upright plant about 15-30cm high. The flowers will last anywhere from 3-6 weeks, and the foliage is attractive and shiny green all year-round. K. blossfeldiana flowers in late autumn to early winter. – Kalanchoe is a popular plant during Chinese New Year celebrations, as it is said to bring wealth and prosperity. – These plants are cultivated as ornamental houseplants and rock or succulent garden plants. This plant is known to the Chinese as “thousands and millions of red and purple”. – Some species contain toxins that can cause cardiac poisoning in grazing animals. – The plant has been used in traditional herbal medicine to treat infections, rheumatism and inflammation. – Kalanchoe extracts also have immunosuppressive effects. Kalanchoe pinnata has been recorded in Trinidad and Tobago as being used as a traditional treatment for hypertension. Kalanchoes are pretty low-maintenance plants, thriving in the low humidity of winter households. Light: Kalanchoe need lots of light, preferably a south-facing window in winter and bright indirect light (or east/west window) in summer. If your Kalanchoe plant is looking leggy and thin, it probably isn’t getting enough light. Temperature: Kalanchoes do fine in normal household conditions, but they need to be kept away from drafts. Keep your kalanchoe above +10°C (50°F). Many people choose to throw out the plant after it is done flowering, but it can re-bloom with a bit of time and patience. Cut off the flowering head and let the plant rest for about a month. Then give it at least 12-14 hours of continuous darkness followed by 10 hours of bright light for 6 weeks to develop buds. Reduce the watering and feeding during this time. Once the buds have formed, the plant can resume its normal light conditions. All parts of plant are poisonous if ingested. This plant is in a group of several plants that contain naturally-occurring poisons that affect the heart, specifically cardenolides or bufadienolides. These poisons are called cardiac glycoside toxins, and they interfere directly with electrolyte balance within the heart muscle. Do you grow Kalanchoe in your house? What is your experience with this plant? Please share in the comments below! Do you sell Kalanchoe seeds or have plants for sale? You can place your advertisement here. Contact us now! Kalanchoe blossfeldiana hybrid. But not sure which one.